I graduated in 2013 with a first class honours degree in Applied Physics from the University of Limerick, and then started a PhD and joined the Nanoscale Physics Group. I have been attending events and volunteering with IOP in Ireland since 2014 and became a member of IOP in 2017 to be part of the various groups that were relevant to my own research. I was coming to the end of my PhD and wanted to become aware of possible jobs and research events going on in the UK and Ireland. I had also heard of the various grants available to IOP members and wanted to apply for them. The IOP has played a huge part in my studies and career so far. In 2017 I received two grants from IOP’s Research Student Conference Fund and the C R Barber Trust Fund that enabled me attend the ninth International Conference on Materials for Advanced Technologies (ICMAT 2017), which was held in Singapore. Without my membership to IOP, I would not have been able to attend this large international conference and share the results from my PhD with experts in my field of study, which focused on direct methanol fuel cells. I then wrote a conference report that was published in IOP Energy Group’s newsletter. The publication of this report allowed my research to reach a much wider audience. In 2017 I received two grants from the IOP that enabled me to attend the ninth International Conference on Materials for Advanced Technologies (ICMAT 2017) in Singapore. 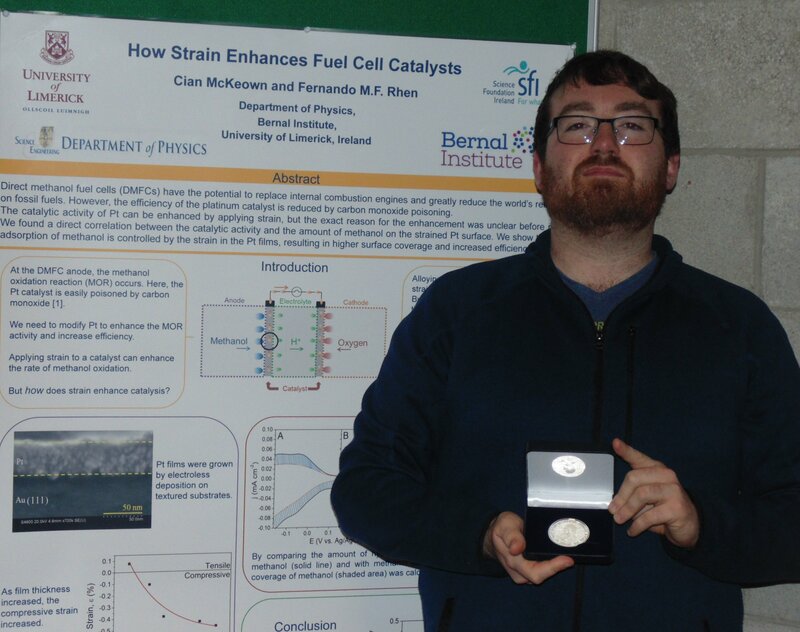 I have presented my research at IOP in Ireland’s spring meeting and in 2017 won the Rosse medal for communicating postgraduate research. I feel that my science communication and presentation skills have improved since attending IOP events. As a result of winning the Rosse medal, I was invited to present an award at the 2018 BT Young Scientist and Technology Exhibition on behalf of IOP in Ireland. All of these events have helped to promote my research and give me more opportunities for the future.